It’s not very common to hear about a 19 year old that works for NASA and is steadfastly working on a solution that will improve the lives of many at a very human level. That’s right, meet Easton LaChappelle. Easton is that 19 year old visionary and innovator that sees the differences between Science and Engineering and is bringing them together. 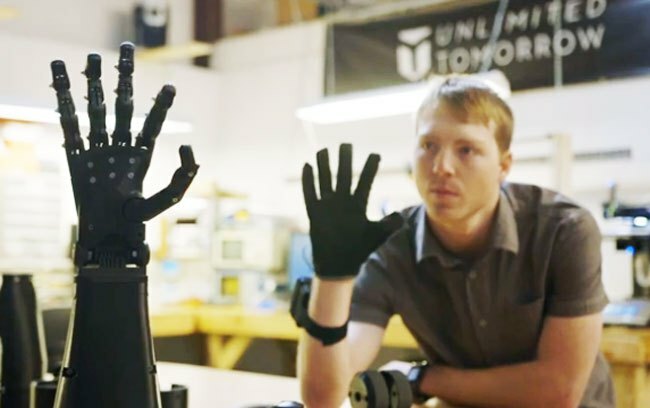 He is moving them forward into Manufacturing to produce “first of a kind” artificial limbs, enhancing the real human world of life improvement. The average rate of amputation in the United States is 4.9 per every 1000 people. While 52% of individuals with limb loss being under the age of 65, much of these people are using prosthetics to retain a quality of life and re-enter the workforce. The use of prosthetics allows individuals with the loss of a limb to perform the normal functions of daily living. A large percentage of individuals with limb loss (70% to 90%) are able to return to work and function in their home environment. Because prosthetics allow an individual to perform activities for themselves and have more control over their lives, it helps people deal with the psychological trauma of limb loss. However, artificial limbs cost more money than the average person can afford even with insurance benefits. So how does a country and its population make these devices accessible to those that need them? It’s possible Easton LaChappelle may once again have an answer. You have to get to know him a little to understand his mission. Easton decided early on that to be successful you didn’t necessarily have to follow the conventional routes. Going through college, getting degrees and then entering the corporate world at the bottom of the ladder. He could see that in today’s world there were so many opportunities and resources, so he might as well take advantage of them and do something he really loved. Easton knew he could potentially touch someone’s life in a positive way while directly impacting the world. This was Easton in the seventh grade. He knew that no one was going to hand him anything and he wasn’t going to wait around to get lucky. Easton is the first to tell you that if you want something you have to go out and get it. When he reached the age of 14 to 15 he was able to take much of his younger experience of tinkering with projects and actually do something practical with all of it. 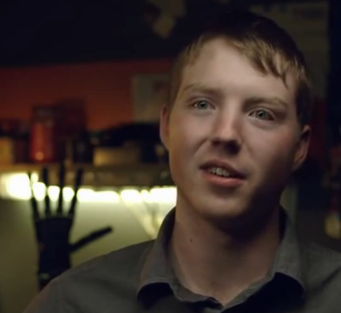 His first big idea came about as a freshman in high school to create a robotic hand that he could control with his own hand. While part of his idea seemed a little farfetched at the time, he persisted. The idea was to create a glove that he would wear and by moving his hand, the robotic hand would mimic the motions. As a 14 year old the mechanics of industry and economics didn’t matter as much as the fact that it was simply a fun project. He thought, how cool would it be to make it all work. When he turned to the internet he found open source communities to begin his discovery of how things worked and why they worked. These communities allowed him to see what others were doing and connect with innovative ideas. From there he discovered online resources like the “Maker” type sites, Instructables.com and other smaller websites that he could relate to. However, there were no tutorials to guide him through what he needed to do. The first thing he did was learn how to read the sensors that were going to be on his glove within the software. Then he figured out how the sensors needed to be wired to the glove and the software configured to read the data. Once this was done he had to integrate the data into a micro-controller and micro-processor. “All of those basic skills I had developed came together into one big project”, says Easton. Then he took the raw readings from the sensors and he learned how to convert those to motor signals, learned how to hook up the motors and then combine everything into one. One of the main challenges he ran into was incorporating everything into a wireless type of system. One problem will affect everything in this case. So he went after a knowledge of electronics and radio to help him. “During this period of 3 or 4 months there was a lot of trial and error,” says Easton. “I really learned a lot from trying and failing”, he adds. Through this he got his wireless system working. Before doing this project he would make videos with his friends and they spent time getting into animation and creating videos that included simple forms of animation. And so, his back ground in 3D animation lead the way into 3D CAD modeling for the project. Basically he would take a video and 3D track the scenes. Then he would color correct and clean the animation up with CGI technology. He could really see how these different experiences would help him with the project. Once he had made his first hand, he made the first leg of his project open source to give back to those communities that helped him along the way. As a result, schools around the world started sending him videos of their projects they created from his online contributions. Easton continued to refine his work and started working with 3D printing. He realized that his project could really be implemented practically through 3D printing. 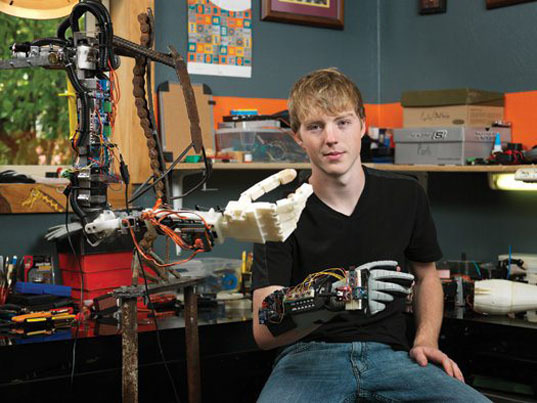 Being restricted by budget he worked on designing his next hand model at 14 in a CAD design system and turning to a mentor of his that worked for Makerbot to help him with the 3D printing. He sent him the models and they in turn 3D printed them for him. Now he started working with metals and refining the project. The first leg of his reveal were science fairs that he could attend. “During that time I went for creating the entire arm and getting into better control systems etc,” says Easton. During one of the science fairs, Easton met a 7 year old girl using a limb that cost $80,000. Suddenly things took on an entirely different meaning. He realized that because she was only 7 years old she would need a series of new prosthetics as she grew up. It was clear that this would amount to hundreds of thousands of dollars through the years to come. That struck him as far too much. “This was the first real moment I realized that what I was doing could change peoples lives,” says Easton. “Suddenly there was some real motivation and the goal became to figure out how to make a more affordable version of this centered around the user,” he adds. At that point he started talking to as many prosthetic users as he could find to really learn as much as he could. He began seeing that the devises were really not centered around the user. Rather they were built around a problem as opposed to a users needs. While normal prosthetic hands focused on open and close he needed to make the hand move like his did. He found this eye opening and started looking into how amputees were using prosthetics in sports and getting valuable feedback from talking to them that he simply couldn’t get online. Now he began finding a way to develop a prosthetic arm that was lighter than a human arm and that would move as a real arm might. “In order to get the same function and similar strength is quite a feat in itself,” states Easton. “And then to keep it aesthetic and anatomically correct to a human arm while under the weight of a human arm became my goal and was the challenge,” he adds. 3D printing was a critic piece at this stage that helped him solve these issues. It was on his 16th birthday that he got his first 3D printer from a Kick Starter project. So he started prototyping day in and day out until he had his first 3D robotic arm that was centered around a user rather than a problem. This, which was something that he never forgot after having met the 7 year old girl as her device only had a single muscle sensor. The only motion was for the hand to open and close. “The device was a rudimentary sort of claw in a sense,” says Easton. From his observations, it seemed like the sensors and control system were something that prosthetic companies had overlooked in ways. The challenge really was how do you merge man and machine and create a second nature control system. Easton began looking at ways to get the brain to control the arm, and to get muscles to control the arm. As a result he ended up making a sort of hybrid of both using a brain wave sensor. After some work with his software and working with wireless radios he was able to make the hand open and close with great accuracy. Then he was able to put everything together and through using the headset was able to get the arm to move the way he wanted. The next phase was making the system simple and that is when things started to take off for Easton. The very first prototype was featured in the Popular Mechanics Backyard Genius when he was 15. Easton continued to use the science fairs as a platform for the project. In 2012 when he was a sophomore he attended the International Science Fair in Pittsburgh where he placed 2nd in the world in engineering. With this he began gaining a lot of media attention which then led to him being invited to the White House Science Fair in early 2013 where he was 1 of 100 students that were invited. 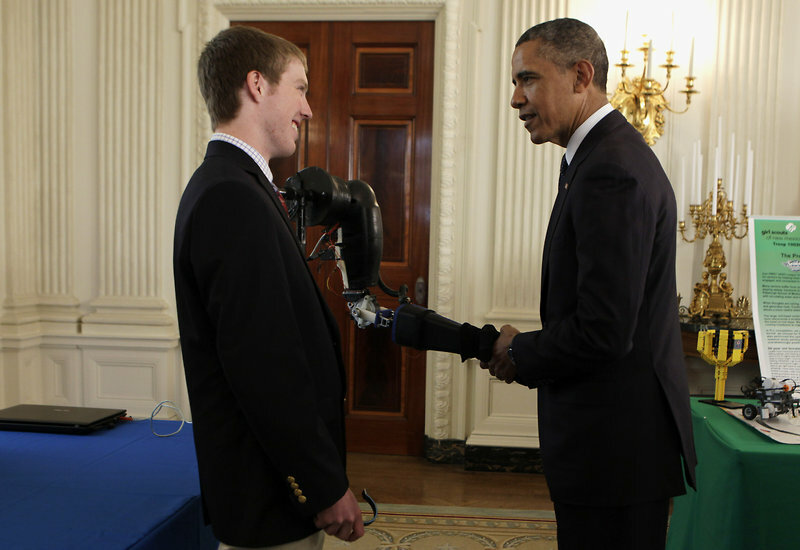 From that he was one of 7 students that got a chance to speak with President Obama. Right there in the dining room of the White House President Obama shook hands with Easton’s robotic arm. This moment fueled Easton’s determination to achieve even greater results with the project, refining the arm and seeking out a better control system. “I would have never imagined that this would branch into a moment like that,” says Easton when asked about his meeting with President Obama. It was during this time that a fellow student Easton knew was the victim of a horrible car accident and as a result the young man was paralyzed from the waist down. Easton saw this as an opportunity to help another person to change their life for the better. Somehow Easton understood the psychology of someone who had lost a limb which, if you think about it, is amazing in itself as he was still so young himself. He began going back to the drawing board with a new project called an “Exoskeleton”. 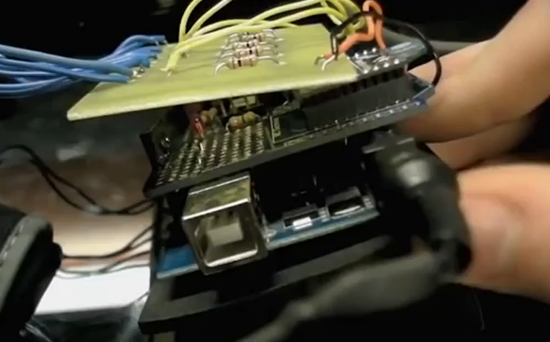 A devise that would allow someone who is paralyzed actually walk again. His goal became to make it possible for his friend to regain independence and the ability to walk. Moving forward, after several prototypes Easton spoke at TEDx Mile High in Denver, Colorado in mid 2013. As things continued to develop Easton received a call from American life coach, self-help author and International motivational speaker Tony Robbins who inspires and helps thousands of people with various life issues. Mr. Robbins has devoted much of his time and energy to helping victims with the psychological aspects of having experienced a severe accident. Apparently, Robbins was listening and watching what Easton was doing. Robbins had recently helped a young lady deal with the loss of her children and baby after a movie theater shooting in Colorado, who became paralyzed as a result. The goal was to help her with the physical aspects of her injury. After Easton graduated high school he and two others, Aaron Blue and Tim Schnieder formed their company called Unlimited Tomorrow with the help of Tony Robbins to pursue the Exoskeleton and other products. Once again, Easton saw that similar exoskeleton type products on the market cost $100K or more and only had a battery life of about 3 hours. And again, the devises did not center around the user, rather the function instead. They simply didn’t give the user a lot of practical life type functionality. “It also goes back to the psychology as well where you have to have something that is organic looking that represents human life and experience properly,” adds Easton. As a result Easton started experimenting with silicone materials that would go over the hands to make them look more human-like or something that could be made to look like the persons other hand. “The thing with exoskeletons is that they are big and bulky which makes the person sort of the center of attention. The only other alternative is a wheelchair which is also a center of attention type situation and we just want to get away from that,” says Easton. “It’s amazing piece of technology but I think it can be better,” he adds. Generally you have this structure that goes around your body that also includes a large backpack. So Easton is prototyping a structure that is small enough to actually fit underneath a person’s cloths. The first question for Easton was how to fit more batteries into it but realized the first question was how to do more with less power. That was a huge question. How to do more with less power became the focus. Since February 2015 they have worked on the efficiency issues, building and prototyping and patenting the results. To be able to bring a device like this to market, Unlimited Tomorrow would have to pursue FDA approval. Because the unit is a Class 2 medical devise they would go through clinical trials that will collect clinical data in order to support their medical claims for the product. During the beginning of Unlimited Tomorrow and attempting to turn the ideas they had into reality they got involved in the manufacturing side of thing and began working with CNC machines. In adding to the affordable 3D printing they were already using, they needed to expand the manufacturing process to make a final product. 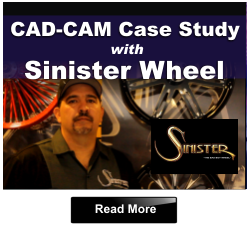 This brought Easton to the world of CNC machining and CAD-CAM programming. With no prior knowledge of CNC or CAD-CAM software, Easton began learning about the process of programming toolpaths and machining. They used CNC machines to produce molds for parts out of composites and different metals. “It’s one thing to have this powerful equipment, but how do you actually control it and turn a drawing into an actual part?” is what Easton asked himself. This is where Easton found BobCAD-CAM. “This is where the BobCAD system comes into the process,” says Easton. 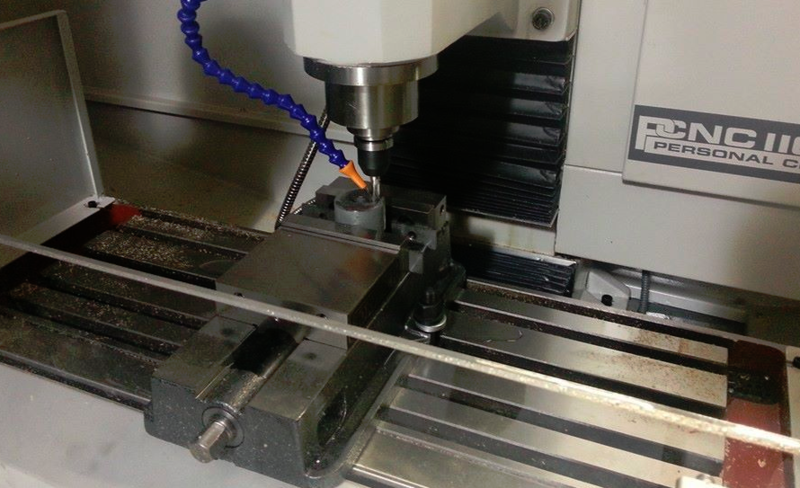 “Because we do a lot of very precise and accurate machined parts using the 4th axis capabilities, we needed someone who was definitely an industry leader that was also used in the medical and aerospace industries is how we discovered BobCAD-CAM,” he adds. He continues, “we needed a company that had the corporate structure to continue development and who would work with us and provide us with the specialty type machining things we need.” “We’re all about efficiency. Being that we can sit down and design something and have it being made an hour later, we are all for that.” he continues. CNC is an important aspect of the overall creation of 4th axis parts as well as parts out of aluminums in order to decrease weight. This gives them the rigidity they need as well as hold the accuracy and tolerances they must maintain. They do a lot of in-house production, vacuum infusion to produce the needed panels. They machine the panels as there are special hole patterns for different brackets and more. They use a Tormach 1100 CNC machine with a 4th axis to make the precision components they require. “It was easy to get started,” says Easton. “The CNC was fascinating for me to pick up,” he adds. “We use SOLIDWORKS for our modeling and then go directly into BobCAM with STL files we create to get right toolpaths and the g-code we need,” says Easton, referring to the process. 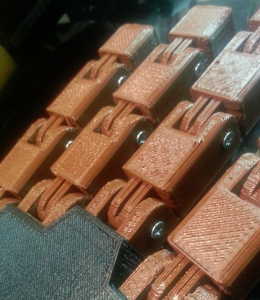 They have decided to make their newest 3D Printed arm open source. Even as Easton refines his designs, he’s using new and more powerful tools such as the HP Sprout to post his designs online for anyone to refine, repurpose, and use. He’s not just creating one thing, he’s giving everyone the ability to be their own engineer, to take what was once an involved, arcane process and make it one anyone can do. As tools such as the HP Sprout continue to proliferate, making 3D modeling and object scanning as simple as placing the object under a camera, he continues to redefine the world. Unlimited Tomorrow believes the combination of current technologies with open ended curriculum is a powerful combination to produce creativity in today’s classrooms. Really focusing on STEM; Science, Technology, Engineering & Math. It’s more than just robotics and engineering. This is taking practical 3D printing even further into education space and change the face of consumer 3D printing. “Students can learn about all of this at a much younger age than ever before and have real practical knowledge,” says Easton. “The open source aspect of this is creating teams of online developers, engineers and makers out there which is really amazing,” he adds. “If you do good things in the world, business will come and the people will be there,” he says when asked about the business side of his projects. “If you just go after everybody for a dollar at the end of the day then what do you have….just a lot of money and that’s about it,” he continues. 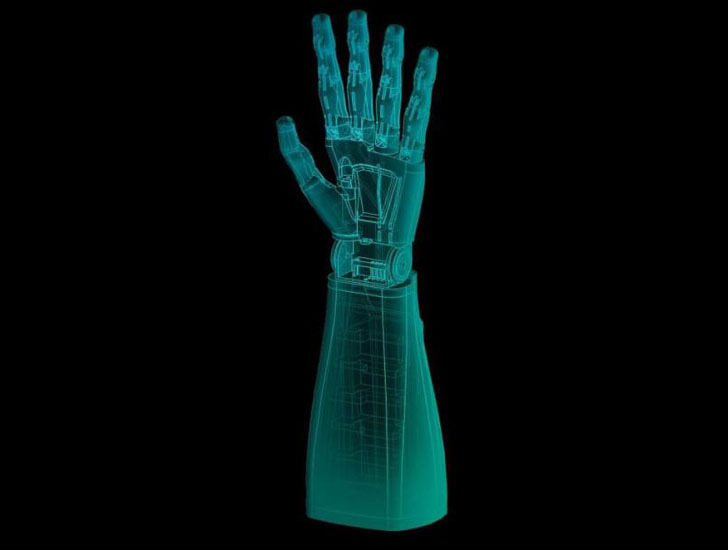 This coming after he announced recently at the CES (Consumer Electric Show) in Las Vegas that their new robotic arm research and technology will be open source, releasing everything online February 7, 2015. For more information on BobCAD-CAM CNC programming software, contact BobCAD-CAM directly at 877.262.2231 or 727.442.3554. I would like to know information on how to purchase a left, prosthetic arm from Easton Lachappelle. Please help! I have been trying for close to a week now and I’m coming up with blanks on where to purchase an arm to the elbow. If you can help me that would be great. It’s for my roommate, he seems to have a bit of challenging times right now in life especially that he is an engineer and is currently unemployed and I want to give him a “helping hand”. Please get back soon, Brandon Micheal peniuk. Thank you for contacting us. You can send an email to Easton at [email protected]. He will respond. Let us know how things go with your project.